SATELLITE VIEW : It is a very pleasant late Thursday Afternoon/Early Evening across the Findlay and Hancock County Area. Temperatures currently this afternoon are mainly in the upper 70s to around 80 degrees. RADAR CHECK : We have a clear radar scan currently across the Findlay and Hancock County Area. As the area of rainfall back in Northwest Indiana moves towards the region, that as a result will bring an increase in cloud cover. A shower or two can not be ruled out before Sunrise Friday. Overnight low temperatures tonight are forecast to drop back into the middle and upper 50s. SOGGY FRIDAY : Friday will be featuring a simple forecast. However, it will not be nice weather. Rain is forecast to be in the area all through the day. A north wind will begin to set in. High temperatures only in the middle 60s. For the Friday Night football games, make sure to take the rain gear with you. Temperatures are forecast to drop through the 50s during the evening hours. The remainder of Friday night will continue to feature mostly cloudy skies. Overnight low temperatures Friday Night are forecast to fall back into the middle and upper 40s. 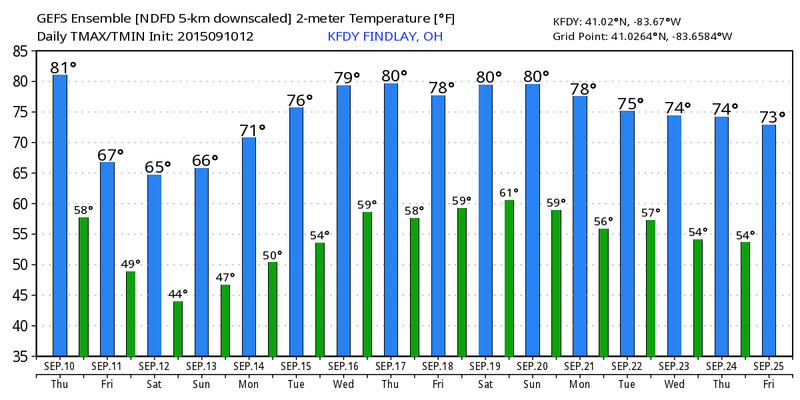 CHILL IN THE AIR THIS WEEKEND : The first true taste of Fall arrives this weekend. Mostly cloudy skies are in the forecast for Saturday, along with chances for scattered showers. Sunday is forecast to feature plenty of sunshine. The nights will be chilly as well. High temperatures Saturday and Sunday are forecast to top out only in the middle to upper 60s. Overnight low temperatures Saturday and Sunday Night are forecast to bottom out in the middle 40s. WARMER WEATHER : Temperatures will be in the process of warming up for the first part of next week. Plenty of sunshine through the middle of next week. Shower and thunderstorm chances do return by Thursday of next week. Temperatures during the day are forecast to warm into the upper 70s to lower 80s. Low temperatures through the period are forecast to drop back into the middle and upper 50s. 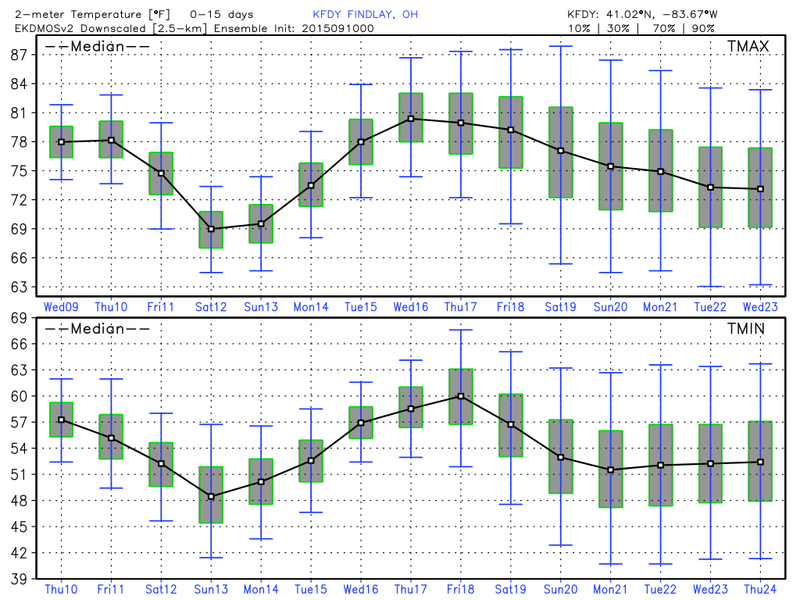 The temperatures in the long range ensembles do also indicate the warming trend for next week. These do pick up also on the rather chilly temperatures for this weekend. Look for the next Findlay Forecast Discussion to be sometime Friday Afternoon or Evening. Enjoy the rest of your evening! Posted on September 10, 2015, in Uncategorized. Bookmark the permalink. Leave a comment.